Fig.1: 1-d height-height correlation function: with ξ = ~0.8. The present work is at the interface of studies of fracture and structure of materials. What can be known from a fracture surface? Can we improve our knowledge of a material structure from its fracture surfaces? Fracture surfaces of a quasicrystal are here considered. On the quasicrystal side (QC), aperiodic materials can be seen as the projection in three dimensions of a periodic structure in a virtual space of higher dimension (6 for QC with icosahedral (i-) symmetry). In real space, the structure may be described as an aperiodic assembly of overlapping, so called Bergman or Mackay, clusters. This very cluster structure was suggested to be at the origin of the mysterious stability of QCs. Clusters being able to be preserved in a fracture experiment, analysis of fracture surfaces are an attempt to found evidence of their relevance in the structure. 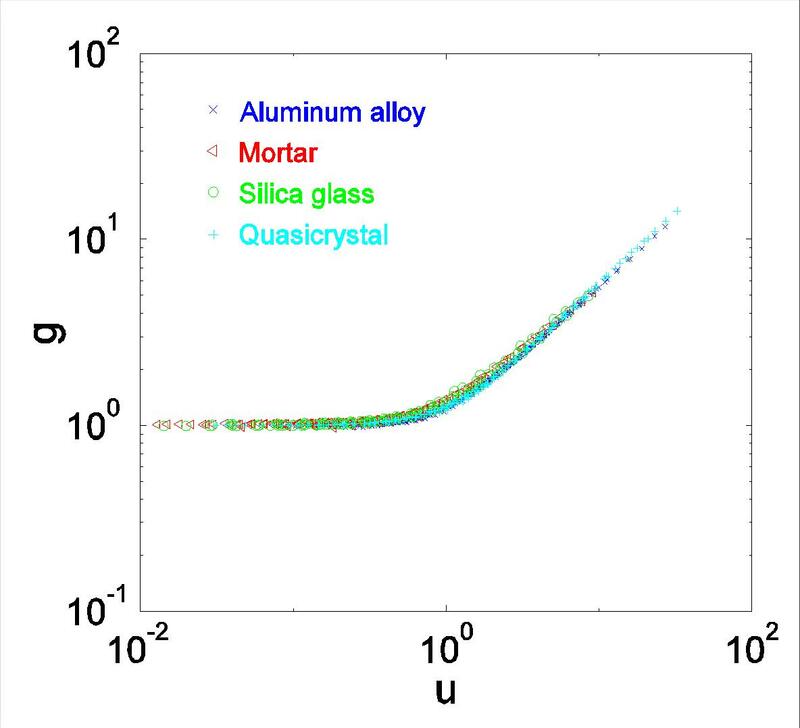 On the fracture side, roughness of the fracture surface of various heterogeneous materials (Al alloy, mortar, silica glass…) was shown to be self-similar whatever the heterogeneity characteristic length is. This universal behavior with z = 0.8 power law dependence is pointed out from the elementary grain scale up to the process zone size given by . Accordingly, i-AlPdMn QC offers unexplored conditions: the extension of the process zone (estimated from the toughness ΚIc and the upper yield stress σY at room T) is of the order of ~ 0.09 nm, lower than the atomic size, making i-AlPdMn a hyper-brittle material. 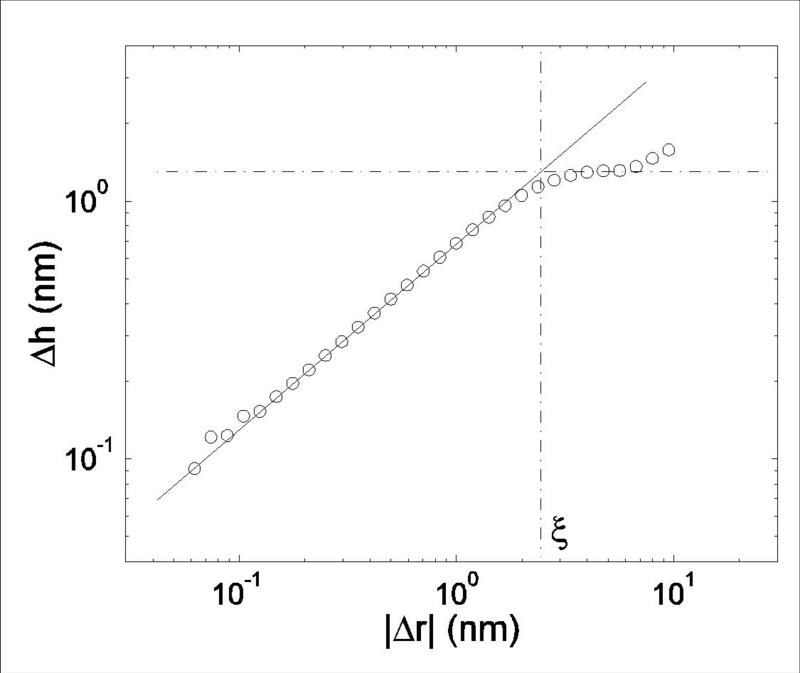 Fig.2: Universal Family-Vicsek scaling of fracture surface roughness. For comparison purpose, distances are normalized using the so-called topothesy (see reference). Finally, the size of the process zone can be understood taking into account the temperature elevation ΔT at the crack tip. ΔT is function of the temperature dependant upper yield stress σY(T) and of the process zone size itself Rc(T), the other parameters being weakly T dependant. Solving the system, one gets a process zone of 4 nm in agreement with the experimental value and a temperature of 540 K. For the very first time, temperature effects are reported to be responsible for a transition from a perfectly brittle behavior to a nanoductile one. L. Ponson, D. Bonamy, and L. Barbier, Phys. Rev. B, 74, 184205 (2006) and Ref therein. Ph. Ebert, M. Feuerbacher, N. Tamura, M. Wollgarten, and K. Urban, Phys. Rev. Lett. 77, 3827 (1996). Ph. Ebert, F. Kluge, M. Yurechko, B. Grushko and K. Urban, Surface Science, 523, 298 (2003).